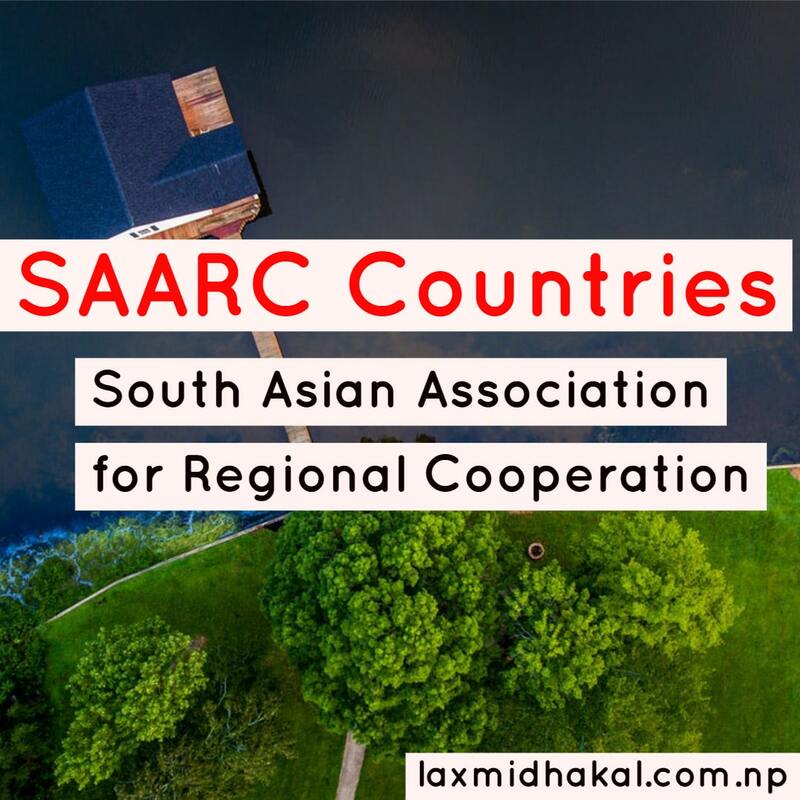 'South Asian Association for Regional Cooperation' is the full form of SAARC. 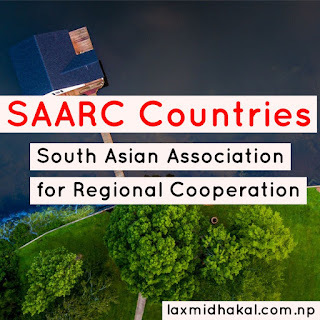 We are going to know about SAARC countries in this article. Please share this article with your friends. Nepal - Nepal is a Country in the southern slope of the Himalaya that lies between India (to the South) and China (to the North). The Capital city of Nepal is Kathmandu which is on the Mahabharat Range. The area of Nepal is 1,47,181sq. Km. 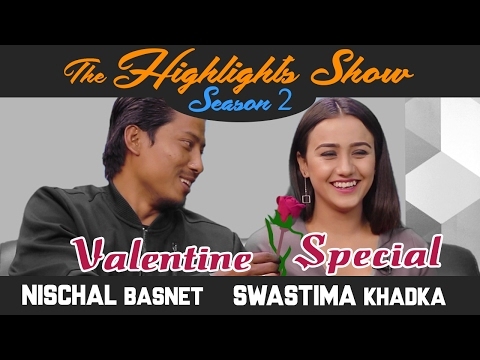 with the population of Nepal is about 27Million The national language of Nepal is Nepal although there are several other regional languages. Most of the people here believe in Hinduism and Buddhism though there are some Islam and Christianity followers. The main occupation of Nepalese people is agriculture, but urban people do trading and service. The currency of Nepal is Rupee or Rupaiya. Neplease standard time is 5 hours and 45 minutes faster than the Greenwich Mean Time. India - India or Bharat is a South Asain Country that is in the south of Nepal. It is the 7th largest country in the world with the population density 274sq. Km. The area is 3287263sq. Km. It is also the second most populated country in the world with the population about one billion. About 80% of people there are Hindus, 11% people are Muslims and rest including Christians, Sikhs, Buddhists are just 9%. The national language of India is Hindi and official languages are Hindi and English. There are hundreds of regional language. The main occupation of Indian people is agriculture, trade, industry, service, etc. The Indian currency is rupee and Indian standard time is 5 hours and a half faster the British time. India's literacy rate is about 53 percent. Bangladesh - Bangladesh, bounded three sides by India and one side by Myanmar, lies to the north of Bay of Bengal. It is a poor but fertile country whose of low-lying land and repeated flooding has largely dedicated its fortunes. The capital of Bangladesh in Dhaka. It has the area of 1,43,998 sq. Km. and the population about one hundred and ten million. The national language is Bangla. Most of the people here are Muslims though there are some Hindus, too. The currency of Bangladesh is Taka. The main occupation of the people of Bangladesh is farming and fishing. Pakistan - The country, Pakistan, was established as an independent state in 1947. This Islamic Republic's capital city is Islamabad. The total area of Pakistan is 803,940 sq. Km. with the population of nearly 150million. The main language of Pakistani people is Urdu and the major religion is Islam. The chief occupation is farming and the country exports cotton in a large deal. the currency of Pakistan is Rupee. Bhutan - A small isolated country, Bhutan, is covered in forests and snow-capped mountains. The country is ruled by a monarch known as the Dragon King. The capital city of Bhutan is Thimphu. It has an are 47000sq. km. and the population of Bhutan is 2.5 Million. The main language here is Dzongkha, though there are Nepali language speakers too. The major religion is Buddhism and one-fourth of the population follows Hinduism. The chief occupation is farming and fishing. The currency of Bhutan is Ngultrum. Sri Lanka - Sri Lanka, formerly known as Cylon, is famous for the first nation to choose a woman as a prime minister. The capital city is Colombo. Sri Lanka has an area of 65,610 sq. km. with the population of about 20 million. The main Languages of the country are Sinhalese and Tamil. People here are Buddhists, Hindus, Muslims, and Christians. The main occupation of the country is farming and is famous for tea. People also involved in fishing and tourism. The currency of Sri Lanka is Rupee. Maldives - The Maldives is a tiny Asain republic country in the Indian Ocean just southwest of Sri Lanka. It consists of 1190 small coral islands, only 202 of which are inhabited. People have lived there for 2300 years. The area of Maldives is 300 sq. km. with the population about 3 hundred thousand. The capital city is Male. The main languages spoken here are Dhibedi, Sinhala, and Tamil. The islanders live from fishing and growing coconuts, However, tourism is the main occupation in big islands. The currency of the Maldives is Rufiyaa. Afghanistan - Afghanistan is a landlocked republic in Central Asia. It is bounded by Russia to the North, Pakistan to the east and south, China to the northeast and Iran to the west. The area of Afghanistan is 647,000 sq. km. with the population of about 25 million. The Capital city is Kabul. The main Languages of the country are Pashto, Dari, and Persian. The major religion is Islam. The occupation of the people is dry-fruits and opium production. The currency of Afghanistan is Afghani. Afghanistan, one of the world's poorest countries, has a long story of war, but getting better in football these days.